Aljon and Kristen dressed as Marvel's Thor and Lady Sif meet the Mad Hatter at this year's Mickey's Not So Scary Halloween Party! This Friday Aljon is back with a TON of reports from last week's visit to Walt Disney World! Check out what's on tap! Tune into Sorcerer Radio's WDW Tiki Room - the show about All Things Disney every Friday at 8 a.m./e with an encore airing at 7 p.m./e - www.SRSounds.com ! Merritt Patterson plays Olivia, a once carefree and effortlessly happy spirit, who has recently experienced hardship, leaving her questioning what's important and what no longer matters. Olivia is Luke's twin and first appears in the 2013 Pretty Little Liars Halloween special. Born and raised in Whistler, British Columbia, Merritt Patterson took a liking to the Arts at a young age. Patterson started dancing competitively at age 11 and continued to compete throughout high school. During this time she was also active in theater as well as modeling, going on to win the 2006 “Canadian Herbal Essences’ Teen Model Search” out of 10,000 girls. She made her Film and Television debut with a recurring role on the ABC Family show “Kyle XY.” Following this debut, the roles began flooding in and Merritt was cast in the FOX 2000 feature film “Percy Jackson: The Lighting Thief,” the horror thriller film “The Hole,” The CW series “Supernatural” and the Disney feature for Television “Radio Rebel.” Recently Merritt co-starred alongside Kim Coates (Sons of Anarchy) in the feature film “Rufus” set to be released in 2013. Merritt has a slew of films set for release in the coming year. She will appear in the feature films “Primary,” “Kid Cannabis” with Ron Perlman, as well as in a starring role in “Wolves” with Jason Momoa (Game of Thrones). Known as "The Fallen Angel," Christopher Daniels is one of the most accomplished Superstars in the history of IMPACT WRESTLING. The multi-time X Division and Tag Team Champion is one of the "Originals" who debuted with the organization in 2002. He has competed in some of the greatest matches in TNA history and has long been known to innovate and push the limits in the sport of wrestling. When Daniels started with IMPACT WRESTLING, he was part of the faction “Triple X” until it disbanded, at which point he started a successful singles run in the X Division. He captured his first X Division Championship in an Ultimate X match and held the title for one of the longest X Division reigns in IMPACT WRESTLING history. After a brief hiatus, Daniels is back to his old ways, now racking up more championships with Tag Team partner Kazarian. This villainous duo spent the better part of 2012 in a gruesome rivalry against AJ Styles. At Final Resolution 2012, Daniels defeated Styles in one final match, ending their feud. Who knows what the future holds for “The Fallen Angel”? HALLOWEEN EXPRESS DEALS FOR SORCERER RADIO LISTENERS! SHOP ON-LINE AND PICK UP AT YOUR LOCAL HALLOWEEN EXPRESS LOCATION! Halloween is HERE and we have some great deals for you last-minute shoppers! Just click on a link and get started! 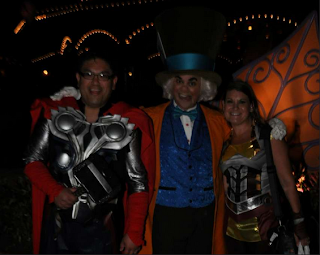 Thanks for Halloween Express for helping with WDW Tiki Room's coverage of Disney, Marvel and Star Wars events throughout the year! Get $5 in your account just for signing up for savings at Seasonal Shop! Always a Free Ground Shipping Option at Halloween Express!